The Discovery Wall is a large-format visualization wall designed to showcase campus-created content for the Auraria community. Situated at the heart of the Library’s first floor, the Wall can also be reserved by classes and campus groups for lectures, presentations, and events. This Wall is a resource designed to showcase and disseminate campus-created and academic content to the Auraria Community. It will feature faculty or student work related to teaching, learning, or research on the Auraria Campus or featured highlights from Library collections. The Discovery Wall can display image, video, web, text, flash-based files in .swf format, and PowerPoint assets and does not currently accommodate executable files. For additional information or other inquiries, please email discovery.wall@auraria.edu. All reservations must be made at least two weeks in advance of the class date. Please use the Discovery Wall Reservation Form to reserve the space for your class, meeting, or event. 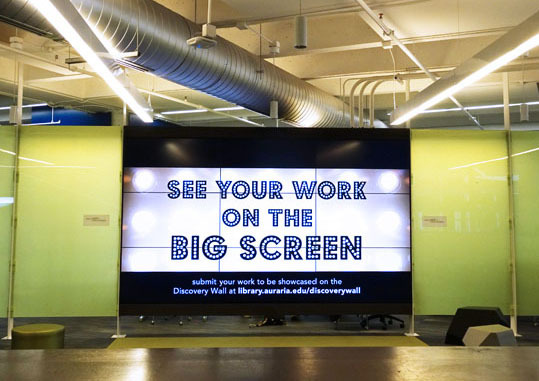 Auraria Campus faculty and students are invited to submit their own projects for display on the Discovery Wall in our monthly content playlists. Submissions should relate to teaching, learning, or research on the Auraria Campus. All content submissions must be free of any copyright restrictions and will be reviewed and approved by internal Library stakeholders before display. For technical details and guidance on content submission, please review the Discovery Wall Content Guide and templates available under Downloadable Resources. You may submit content by completing the Discovery Wall Content Submission Form. Use the New Interactive Floor Maps to view where the Discovery Wall is located inside the library. If you experience download issues, right-click on each link and use the "Save as" option to download each resource.